We can create professional cost effective website for your business and establish consistent branding across your printed menus and online presence. We have website packages to suite your budget and needs but we can also cater the those who wish to have a bespoke site with your unique requirements. Contact us for more information, we are always on hand to offer a friendly personal service and answer any questions you may have. 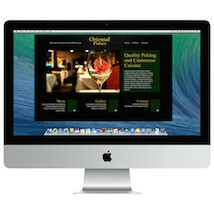 For Three+ Pages Websites: Additional pages can be added at £125+vat per page. All websites created by us includes 12 months subscription which includes:- domain name, hosting and one menu change. Price for subscription renewal after 12 months at £175+VAT (Three+ Pages Website), £50+VAT (One Page Website).